This medium duty box or file drawer slide is constructed with ultimate precision. In fact, this slide has continued to be one of our top sellers and remains very popular. It supports a 100lbs. (45.359kg) capacity and features a full extension plus overtravel, telescoping slide on precision steel ball bearings. Flexible mounting tabs self-adjust to assure side clearance and polymer stop cushions make closing drawers softer and quieter. Recommended Use: Medium-duty, precision slides for box drawer or pedestal file drawers up to 24in. (610mm) wide. Mounting: Side, for frame and frameless construction. Clearance: 1/2in. (13mm) plus 1/32in(1mm) minus 0in. each side. Features: Lever disconnect for easy drawer removal. 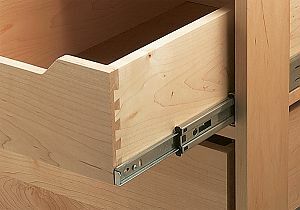 Ball retainer latch and ramps for easy drawer insertion. Drawer adjustment without removal. Flexible mounting tabs self-adjust to side clearance. Metal ball retainer holds 3 bearings per inch for smooth and quiet motion. Non-handed. Slide Action: Telescoping, full-extension on precision steel ball bearings.